Bulldogs veteran Aiden Tolman couldn't hide his disappointment over a crucial penalty try awarded to the Storm at a pivotal moment which brought Cantrebury's momentum to a screeching halt. The Bulldogs got off to a flying start and stunned the Storm with determined defence and constant ball movement which had the home side making some uncharacteristic errors. After 20 minutes the Bulldogs had a 12-0 lead and weren't overawed by the massive odds stacked against them, with Kerrod Holland and Jayden Okunbor crossing the line. The Bulldogs kept their intensity at a consistent level despite being reduced to a 15-player rotation due to injuries to Dylan Napa and Corey Harrawiera-Naira, but the Storm hit back with less than ten minutes in the first half with a penalty try when Will Chambers was taken out by Jack Cogger while in pursuit of the ball in the in-goal area after toeing it ahead with the line open. 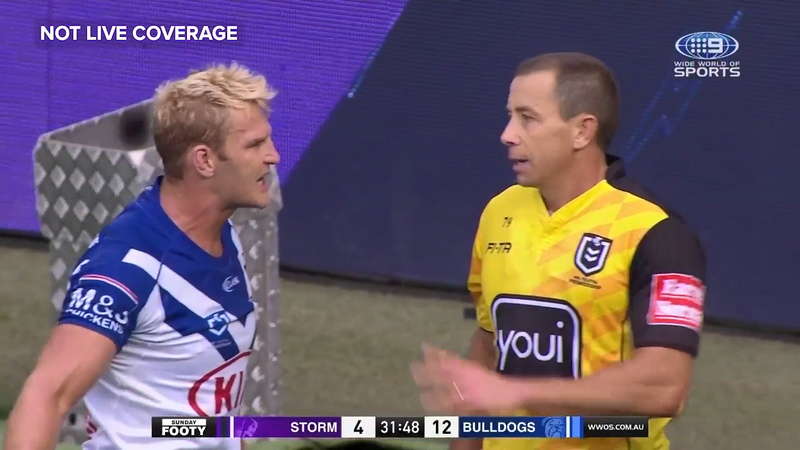 Replays showed the on-field call by referee Ben Cumnmins was correct yet that didn't stop Bulldogs skipper Tolman pleading his case with the whistle-blower. "Will Chambers has touched the ball before Reimis Smith touched it that constitutes him touching the ball doesn't it?" Tolman argued. The prop was adamant that Chambers touched the ball but the referee shut him down saying the decision was reviewed and the call was final. Nine's Phil Gould was skeptical at first questioning whether Chambers had the ball in his hands which would've made the tackle legal. "Is the ball on his hands before?" Gould asked. While Andrew Johns applauded the decision declaring it "a great call". The Bulldogs went into the halftime break up a converted try and found it difficult to stop Melbourne's momentum after the penalty try. The Storm equalised shortly after the break through Tui Kamikamika and grabbed the lead through Cameron Munster late in the second half. The Bulldogs rallied late to grab a try for a chance to send it to golden point but Canterbury's Rhyse Martin couldn't convert from the sideline.